When life hands us lemons, we’re told to make lemonade. So what do you do when nature knocks down your beloved lilac tree? You fill the house with flowers, make photographs, and feed your friends! We awoke last Sunday morning to a changed view from our living room window: an open vista where the lilac tree had stood. Overly tall and top heavy with blossoms, its two largest trunks had fallen over during the night in the heavy rain and wind. In retrospect, I realized we should have been pruning more heavily over the years instead of letting it grow so tall. Hindsight is wonderful, right? So what to do with that tangle of trunks, branches, leaves and blossoms? The smaller of the two fallen trunks was unbroken, so we propped it up and covered its roots with a thick mulch of compost, and we’re keeping our fingers crossed it might survive. Once the flowers fade, we’ll cut it back radically and hope for the best. The larger trunk was a write-off, so I cut off enough flowering stems to fill every vase I could find. Our house has had a glorious scent this week! And of course those blossoms make good subjects for closeup photography. Solo, our two-year old black-tailed deer, has been taking care of the mess. Over several days, we’ve dragged branches out to our unfenced lawn, where he’s been enjoying a feast of flowers. Although lilac are included in both of the “deer resistant” plant lists in my gardening library, it turns out that this young buck really does love those blossoms. 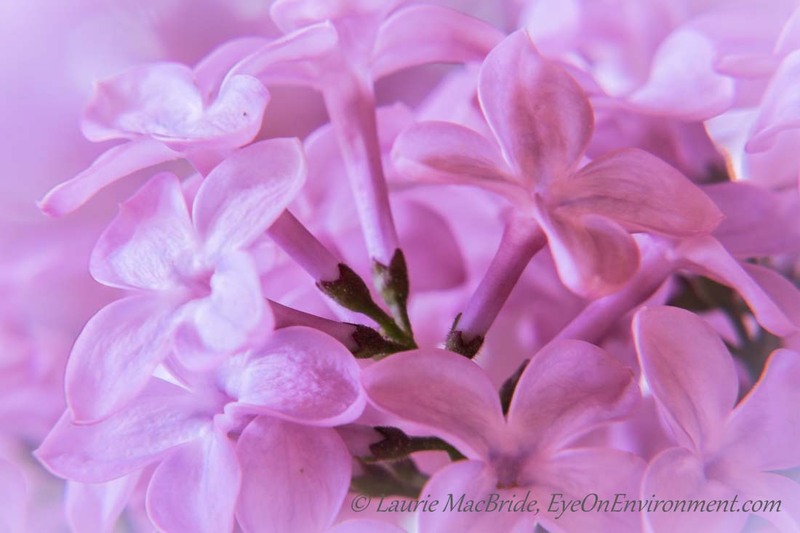 Posted by Laurie MacBride, Eye on Environment on May 16, 2013 in Garden, Mammals and tagged abstracts & impressions, animal behavior, beauty, closeup, deer, flowers, lilac, nature, photos, pruning, scent, trees. So very sorry to hear about your magnificent lilac tree. Glad you and Solo making the best of it. I do hope it will grow again! I expect it will – the newer stems (too skinny yet to call trunks) appear healthy, so it will recover in time. Thanks! Sad news to hear of the loss of that wonderful tree. Hope the surviving portion makes it. Thanks, Phil. There are a good number of small, healthy shoots that originated as suckers from the main trunks, so even if the other trunk doesn’t make it, they should continue to grow up and be fine. We might be short of flowers for a couple of summers though! Sad to lose such a beauty! My resourceful daughter recently made a lilac cordial with fresh-cut flowers … literally, lilac lemonade. The flowers have an interesting taste which I bet works well in a cordial – and I bet the lovely aroma adds to the appeal. Thanks for visiting & commenting, Amy! Laurie , you are ever resourceful! Enjoy your lovely lilacs! Love the photo. And I’m sure I’d be breathing deeply too ! mmmmm….. Thanks, Susan – yes, it smells lovely! compared to mine on Denman. Oh dear…. It was hard for me to believe too – something definitely didn’t compute in my brain when I looked out that window first thing in the morning!